Christine Schreyer can finally disclose her secret identity. 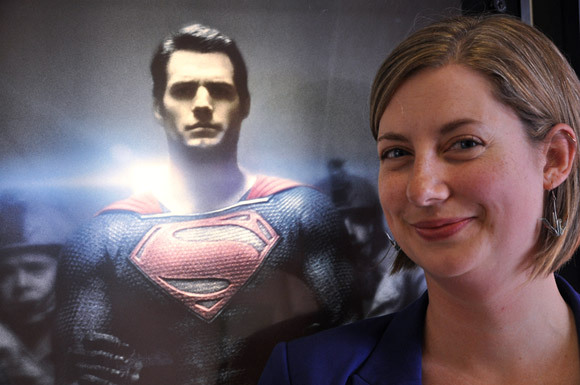 The linguist and anthropologist at UBC's Okanagan campus served as a consultant for the hit Hollywood blockbuster Man of Steel, and helped develop the Kryptonian language for the movie. Given that the Warner Bros.' $225-million Man of Steel is a reboot for the Superman celluloid story, the producers wanted an authentic new language for Superman's doomed home world of Krypton. "They wanted to respect the canon, but come up with something new," says Schreyer, who set about doing exactly that—after signing a confidentiality agreement in August 2011 that she would not reveal her Man of Steel role until after the movie's opening week. On the big screen, Schreyer's Kryptonian symbols appear throughout Man of Steel, among crests on costumes, scripted onto weapons, emblazoned on the mysterious Codex and inscribed on bulkheads, and on the exterior of Kryptonian spaceships. "Kryptonian has never been spoken in a movie—but now there is a created language," says Schreyer, an assistant professor with the Irving K. Barber School of Arts and Sciences. Schreyer has taught a course which examines created languages and her students studied the languages invented by other linguists such as Star Trek's Klingon language and the Na'vi language devised for Avatar. The Na'vi project captured global interest with a strong social media following of fans who did not speak each other's tongue but communicated in Na'vi as their only shared language. An August 2011 newspaper story about her Na'vi project caught the eye of Man of Steel’s Production Designer, Alex McDowell, who happened to be in Vancouver working on another project and contacted her. "Alex brought me in to consult,” says Schreyer, who found herself quickly whisked to Mammoth Studios in Burnaby and she visited the set of Krypton, Superman's home world. McDowell says the idea of developing an entire new and specific language for the world of Krypton evolved from the beginning of production. It was determined that the symbol on Superman’s crest did not simply represent the letter “S” of English, so an imaginative approach was needed. "Christine's contribution to the design and meaning of Krypton in Man of Steel was crucial in a way that will not be fully understood by the audience, but without which we would have been missing a layer of meaning and legibility that in my view enriched the film immeasurably,” McDowell says. “She also pulled together the anthropological logic of the language within our very constrained schedule, remarkably fast considering that the Na'vi language took more than two years to develop for Avatar." Schreyer’s familiarity with Klingon and Na'vi provided a starting point for The Man of Steel requirements since she knew a bit about how other linguists had created languages for movies. "I kept it simple, to bring the words together," says Schreyer, adopting a subject-object-verb grammar structure as opposed to English subject-verb-object construct. She recorded Kryptonian sounds on a digital recorder and emailed files to the production team while on another research project in Whitehorse. Schreyer's biggest challenge was keeping the project secret for two years. “I just wanted to tell everybody about the exciting project I was working on, but I was sworn to secrecy." Schreyer is mildly disappointed there is no spoken Kryptonian in the film. Being brought onboard after filming started meant the opportunity for dialogue changes to the script were limited, although she did submit recordings of the language a few times in the hopes they might be used by some of the Kryptonian characters, such as Russell Crow, the Oscar-winning Aussie actor who plays Jor-El, father of Superman’s Kryptonian Kal-El character. However, Schreyer worked extensively on the viral marketing campaign for Man of Steel, including an online glyph creator where visitors can type in their name and see the Kryptonian spelling and symbol shield that identifies with the name. Now that Schreyer has her Hollywood credentials? "The linguistic community in filmmaking is pretty small, and I am really thrilled to be part of it." Christine Schreyer wrote the Kryptonian language for the Hollywood blockbuster Man of Steel. Just as a heads up, the link to the Glyph Creator needs to be fixed. Great story! !